Fujitsu-fi-60f-Scanner The fi-60F image scanner's small footprint expands the scanning market. These features will insure Fujitsu's customers' productivity well into the future. The compact, lightweight Fujitsu fi-60F high-speed scanner is ideal for busy office and retail environments. It quickly scans important, small documents, such as insurance cards, identification cards, credit cards, passports, driver's licenses, photographs, and more.Coverless scanning eliminates the repetitive task of opening and closing the cover before and after each scan, which saves time when there is a high volume of documents to process. Simply place documents on the flatbed scanner and scan! Only requires 1 second to scan a document in grayscale or monochrome (200dpi). The Fujitsu fi-60F scanner increases user productivity with fast coverless scanning. Fujitsu fi-60F scanner delivers clean, crisp scans up to 5.83 in. x 4.13 in. - in color, grayscale, and monochrome - with true, 600-dpi optical resolution. 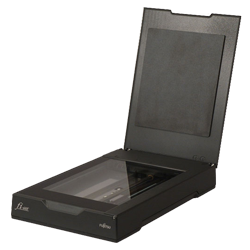 Coverless scanning eliminates the repetitive task of opening and closing the cover before and after each scan. High-speed USB 2.0 connectivity combines outstanding performance and easy installation.